A 10-speed bike is a type of road bicycle that allows you to change the pedaling resistance through a shifting mechanism. The various gears provide up to 10 different resistance settings, or speeds. This type of bicycle engineering makes riding on hilly terrain over long distances easier. Road bicycles are designed only for pavement use and should never been ridden on grass or a dirt or gravel road. A 10-speed bike, and road bicycles in general, feature sleek designs that aim to eliminate as much drag as possible. Road bike frames are typically made from lightweight yet sturdy material, such as titanium or aluminum, or often consist of a composite of carbon and either titanium or aluminum. The lighter the frame, the less weight the biker has to move with his pedaling motion. This helps conserve his energy. Unlike traditional bicycles, road bikes have specially designed handlebars that force the rider to lean forward in a tucked position. This further reduces drag and makes the rider and his bike aerodynamic. The wheels and tires on a 10-speed bicycle are light and extremely narrow. Rims and spokes are commonly made from lightweight titanium or a sturdy composite material to support the rider's weight. The tires are narrow to reduce the amount of friction between the bicycle and the road. Road bicycle tires are intended for pavement roads only. If you ride a bicycle with these type of tires on anything but pavement, you risk damaging or popping them. The inside of a road bicycle tire is lined with a tube that is inflated, which expands the tire and creates a proper fit onto the wheel's rim. Having a bicycle with various resistance settings is advantageous when riding on hilly terrain, especially over long distances. The bike's chain is fed onto a chain wheel with two chain rings at the front of the bike and onto a cassette on the rear wheel's axle. On a 10-speed bicycle, the cassette consists of five different-sized sprockets placed on top of each other. Levers on the handlebars control a derailleur mechanism and shift the chain on the cassette and chain ring. Dialing up low gears makes pedaling more difficult on an even plane, while high gears makes pedaling easier on an even plane. You should use high gears when going downhill and low gears when tackling an incline. Road bicycles are primarily used for racing. Nearly all high-profile bike races feature riders with multiple speed bicycles. The 10-speed bike has become nearly obsolete in professional racing as more technologically advanced bicycles today feature up to 27 speeds, with three chain rings in the front and nine sprockets in the back. Plenty of 10-speed bikes can still be seen on the road and are used for recreational purposes. 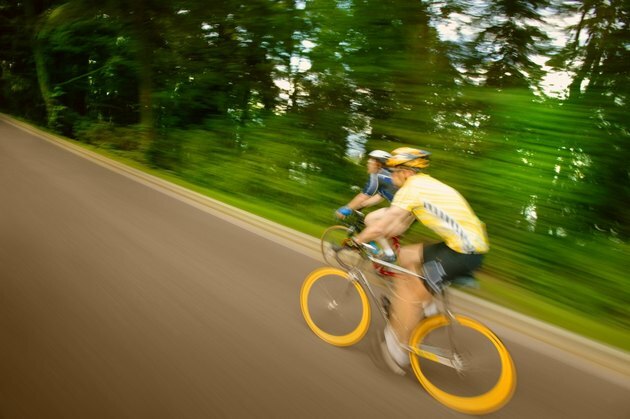 You don't have to enter into a bike race to use a 10-speed, or any road bike for that matter. Road bikes can be used for commuting or leisure activities, like any other bike.